The robust beef-flavored sauce of our Beef Rice Sides brings a medley of onions, carrots, garlic, rosemary, thyme and paprika to easy, tasty meals like our Quick Black-Beans Rice. Beef Rice is rated 4.5 out of 5 by 13. Rated 5 out of 5 by Anonymous from My very favorite flavor - but HARD to find I truly love this flavor, and truth be told, the quality of the product far outshines Rice-a-roni's mushy nasty consistency. But, as others have mentioned, it's difficult to find. My local grocery store chain, Kroger's usually stocks most if not all of the chicken varieties. But the only place nearby to stock the beef flavor is Meijer's. I rarely go there and wish this product was available at Kroger's. I asked my local store to please stock this variety and it never happened. I have been using this product since it was under the brand name Lipton's. Thank you for keeping the recipe as it was while under that name. I saw no change in quality or flavor, and when I can get this product, I really appreciate that fact, and that I don't have to wish it still tasted the same. Rated 5 out of 5 by slap from the beef rice sidesgreat The stuff is great, I love it but I can't find it in the stores anymore.all I can find I'd the chicken! Can anyone help? Rated 1 out of 5 by Discussed with Korr from Lipton to Korr Lipton used to have a lot of nice rice sides that could be added to balance out your meal or to to be used as a base to create a meal. Then Korr took over. I used to love this side but now instead of having a base for a meal I have the equivalent of Rice-a-Roni. Not a fan of rice-pasta combo. If you like Rice-a-Roni you should enjoy this. If you are looking for a good rice side this is no longer a good choice. Also since Korr took over amount the only thing you can find in the store are the pasta sides. Korr you have lost a customer with these changes. 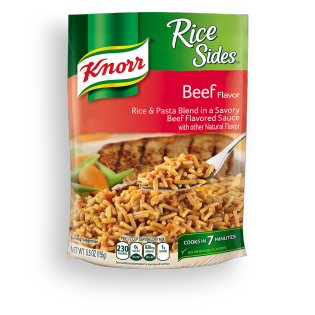 Rated 5 out of 5 by Marlene from Knorr Rice Sides Beef flavor is delicious My family loves this rice dish. It especially goes well with any steaks. Very delicious.